A prominent university in Southern California is utilizing aeroponics to challenge the food systems status quo on campus. The University of Southern California (USC) Teaching Garden was established this spring to supply fresh produce to the university’s on-campus restaurants, dining halls, catering services, and hotel, while also teaching students and staff about flavor and sustainability. The garden utilizes aeroponic towers to produce chemical-free fruit, vegetables, herbs, and edible flowers without traditional soil growing media. Instead, plant roots are sprayed with nutrient-rich water at regular intervals to provide nourishment. 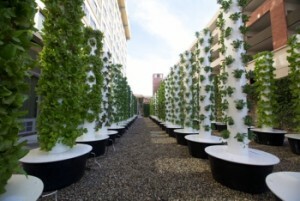 The aeroponic towers at USC’s facility come from LA Urban Farms, which utilizes patented Tower Garden technology. Each aeroponic tower is made with food-grade plastic, has room for a nutrient-rich mineral solution at its base, and holds up to 44 plants. Using this method, the project is able to raise more than 2,640 plants in just 1,200 square feet with 90 percent less water than a conventional produce operation, a boon for a drought-prone megalopolis like Los Angeles. And since growing takes place vertically, land use is kept to a minimum. USC is the first university in the United States to utilize an aeroponic garden of this scale. The project was spearhead by the university’s Executive Chef, Eric Ernest. Of course, the aeroponically-grown produce is also meant for consumption. The garden currently produces heirloom lettuces, watercress, arugula, mustard greens, kale, tomatoes, Swiss chard, snap peas, several varieties of peppers, and more, all from organic seed. Some of the microgreens are delivered in living form on grow-tables for use by chefs. Ernest says the USC Teaching Garden is a small-scale farm-to-fork effort and acknowledges that it will not make a significant direct impact on the broader food system. But because USC is an influential institution of higher learning, Ernest believes students who learn from and are influenced by the Teaching Garden will ultimately be the ones to foment change. “We’re leveraging a unique portion of the university to advance lifelong food choices among students who will become decision makers,” he says. Even though he knows food isn’t the university’s primary mission, Ernest notes that intersections exist between food and numerous other academic disciplines. This is one of the main reasons he pushed for creation of the USC Teaching Garden. Beyond education, the main objective of the Teaching Garden is supplying high quality produce to the university community.